Having a hot tub at home can be a wonderful way to relax at the end of a rough day. A hot tub provides a means of having a spa like experience in the privacy and comfort of your home. Many at-home hot tubs are lightweight and portable. An inflatable hot tub is ideal for homes where you don’t have a lot of outdoor space to set up a large hot tub. Inflatable tubs can be deflated and folded away for storage when not in use. Most are easy to set up and can be ready to add the water in a few minutes. When looking for a hot tub at home, be sure to consider the dimensions of the tub when inflated compared to the space in which you wish to put the tub. Most hot tubs come with their own filtration system so that you can leave them up as long as wish without needing to do frequent water changes. There are different types of filtration and sanitation systems and they all work differently. It’s important to follow the instructions on your system to ensure your water is always clean and ready for use. The following are the top 10 best hot tubs based on consumer report. 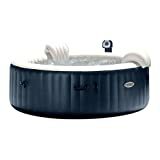 The Intex PureSpa Jet & Bubble Deluxe hot tub is portable and easy to set up. This hot tub has 120 soothing bubble jets for the ultimate in relaxation at home. It also has 4 high-performing massage jets. The tub is 28″ high when inflated and has an inner diameter of 59″. This hot tub is ideal for those who have limited space and need a hot tub that can be stored when not in use. This inflatable hot tub from Intex hold 210 gallons of water and can seat up to 4 people. The water temperature range is 68-104 degrees Fahrenheit. The tub comes with a heating system, a hard water system, salt water sanitation, and a filtration system with 2 filters. 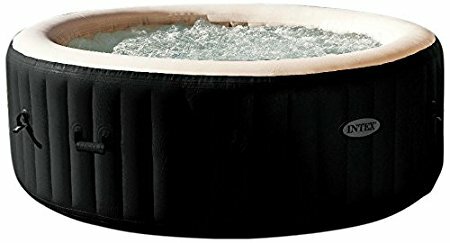 This portable hot tub from Intex can seat up to 6 people. It has an easy to use control panel that activates the 170 bubble jets inside the tub. 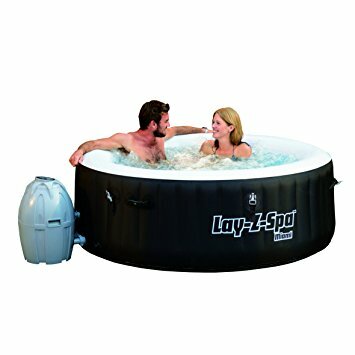 The hot tub is inflatable and can be set up and ready for water in around 20 minutes. It comes with a pump for inflation. The tub can be deflated and folded for storage when not in use. 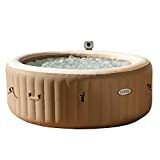 The Intex Pure Spa hot tub uses a unique heating system that heats the air bubbles, which helps to maintain the heat of the water. The tub has inflatable head rests for relaxing while soaking. It’s made with durable materials and is strong enough to sit on the edge so that you can dip your feet in. The SaluSpa Hawaii Hydrojet hot tub contains an advanced jet system to provide a relaxing spa experience. 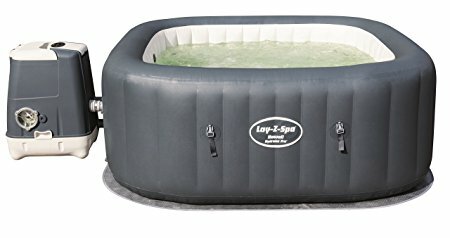 This inflatable tub is quick and easy to set up. It comes with a pump and requires no tools for the setup process. It can seat 4 to 6 people comfortably. This inflatable tub comes with a rapid heating system to get water up to the maximum temperature quickly. It has a maximum heat of 104 degrees Fahrenheit and a maximum water capacity of 177 gallons. The hot tub also comes with a water filtration system to keep water fresh and ready for use at all times. The tub has 9 adjustable jets and soothing bubble jets. 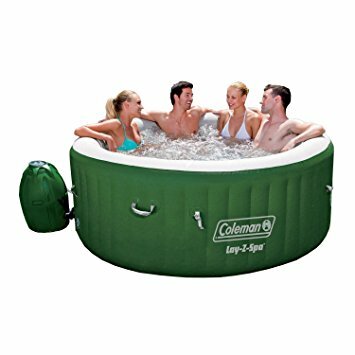 The Coleman SaluSpa 4 person hot tub is inflatable and easy to use. This hot tub is made with durable materials and the outer walls are fabric coated. The tub has 2 handles so that you can easily move the spa when empty. It comes with an easy to use filtration system and 2 filter cartridges for replacement as needed. This portable and budget-friendly hot tub from Coleman has soothing bubble jets for relaxation. The tub comes with a digitally controlled pump for convenience. This tub is capable of seating 4 people and it has massage jets and a cushioned floor for comfort. It comes with an inflatable cover to protect the tub when not in use. The Comfort Line Products Spa N a Box requires no special tools or equipment for setup. This hot tub can be used without any special wiring or plumbing. It is capable of seating up to 5 adults comfortably. This tub can be completely assembled in around 20 minutes. This hot tub from Comfort Line Products is equipped with a thermostatically controlled heater that has freeze protection. It comes with an insulated inflatable cover to keep the hot tub safe and keep the water clean in between uses. The tub has reversible panels that allow you to use them as red-cherry wood or dark walnut depending on personal preference. The Goplus 6 person hot tub has a digitally controlled pump and a soft touch control panel that allows you to set your desired water temperature. The hot tub can be deflated and folded for storage. It also has carrying handles for moving it around when empty. The outer walls of the tub are made from fabric coated material for comfort. This hot tub from Goplus has an insulated ground cloth that helps to maintain the water temperature. It comes with a filter system that is easy to replace as needed. The tub also has a built-in hard water treatment system which helps to extend the life of the spa. The SaluSpa Miami AirJet hot tub can seat 2 to 4 people. 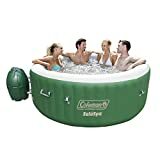 This compact inflatable hot tub is ideal for those who don’t have a lot of space for setting up a tub. It can be set up quickly and comes with a pump for quick inflation. This hot tub has a maximum water capacity of 177 gallons. The maximum temperature of the heating system is 104 degrees Fahrenheit. This inflatable hot tub has a simple digital control panel that allows you to easily control the temperature and the jets inside the tub. It also has an automatic heating system to keep water at the ideal temperature. The included water filtration system keeps the water clean and fresh so that it’s always ready for use when you need it. The Intex 77″ PureSpa Portable spa set has a built-in hard water treatment system to make water gentler on the skin. This tub comes with an insulated cover that helps maintain the water temperature when you’re not using it. The cover also has a lock as an added safety feature. The water filtration system comes with 2 filter replacements. 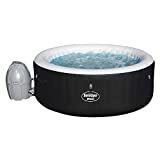 This inflatable spa from Intex includes a heating system, a floating chlorine dispenser, water test strips, a thermal ground cloth, a carrying bag, and an inflation hose. The tub can seat 4 people and has a maximum water capacity of 210 gallons with a max temperature of 104 degrees Fahrenheit. 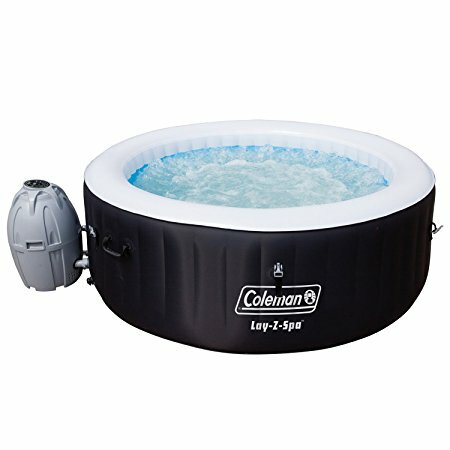 The Coleman Lay Z Spa can seat 4 to 6 people comfortably. This hot tub has a digital control panel that allows you to change the temperature and jet settings as needed. It is equipped with bubble jets for relaxation. The spa comes with a pump to provides a quick method for setup and can have the tub inflated and ready for use in minutes. This spa from Coleman is made from quality materials that are designed to last. The sides are comfortable and provide a stable surface for relaxation. This hot tub has a maximum temperature of 104 degrees Fahrenheit and a maximum water capacity of 254 gallons. The SaluSpa Palm Springs AitJet inflatable hot tub can seat up to 6 adults. The tub can hold up to 242 gallons of water. It has a simple control panel that allows you to easily control the temperature and the jets. It also has an automatic start/stop heating system to maintain the heat. 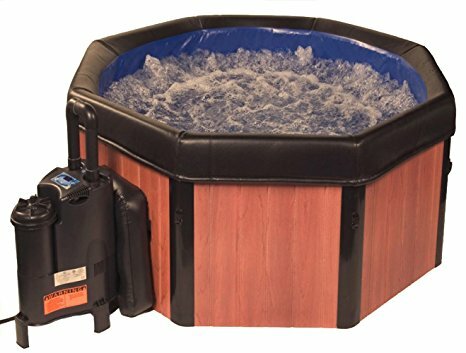 This hot tub from SaluSpa has a quick and easy setup method with the included pump. The rapid heating and water filtration system means that the spa is always ready for use when you need it. The maximum heating capacity of the heating unit is 104 degrees Fahrenheit. 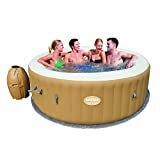 Inflatable hot tubs are relatively easy to set up and work well for those who don’t have the space for a permanent hot tub. They can be deflated and folded when not in use. 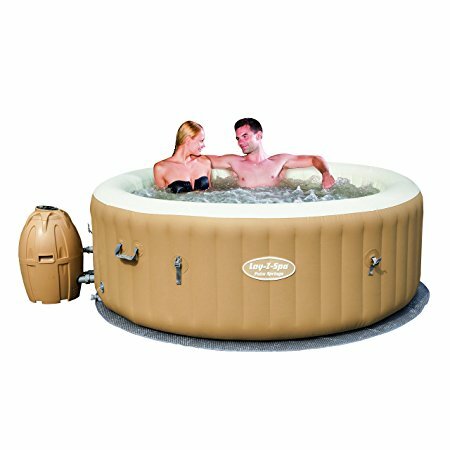 Most inflatable hot tubs come with a pump and can be ready for use in around 30 minutes. 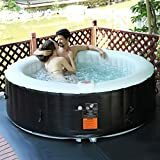 When shopping for an inflatable hot tub, you should be sure to consider the size of the space you have to find one that will fit. Most hot tubs can hold 4 people while some are designed to fit up to 6 adults. It can be beneficial to do some online research before purchasing a hot tub for your home. Some are made better than others and it’s important to get the best option for the money. Most don’t require any special tools or equipment for the setup process. You may also want to consider the amount of water required to fill a hot tub as the larger tubs may require a significantly higher volume of water to be filled to a comfortable level. One of the most important aspects of shopping for a hot tub is the filtration and heating systems. Be sure to find a hot tub that has a functioning heating and cleaning system so that your water is always ready for use when you need it.